Josh Mills, Joe Flynn, James Mallet and Jim Hewins are the contributing members for the band Soapy Jefferson. Using instruments such as electric guitars, banjo, mandolin, melodic, cello and many (really!) others, and under the committing album’s title – “Carnival” (well illustrated on the album cover by “Against it”s Ralf Rabendorn), they offer us a short, yet accurate album in the spirit and the masked joy of a circus band. Imagine a mellow Tom Waits song, confined to the musical instruments I have mentioned above, and you will get the spirit of this album. From “Miss Maybelline” to the end of the album, Soapy Jefferson’s songs are a strange mix of emotions. I have already mentioned a certain form of joy, as the music sounds upbeat and relatively energetic. But at some points of this album you can trace hints of a troubled mind, or a realist, sober and cold traces under the warm performance. 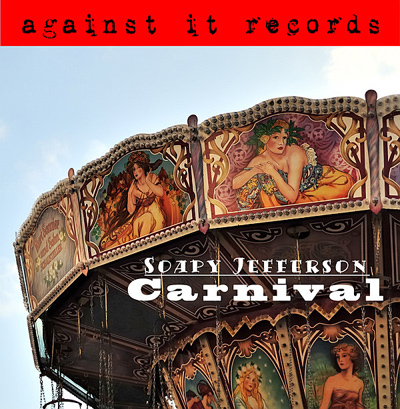 Soapy Jefferson demonstrates professionalism as they execute their songs, and remain interesting and moving like a fun ride in the carnival on a nostalgic, even if rusty ride. Soapy Jefferson should appeal to fans of alternative folk and should not be ignored, as Mills, Flynn, Hewins and Mallet form a charismatic, even charming body of music. Give them a listen!